Will you want music around the house? Will you have a computer or more than one computer? Will you have TV via antennae, cable, satellite or all of these? Will you want room-to-room control? Will there be adequate telephone jacks? Will there be a home theater with surround sound? Is paging, door answering a consideration? Would you prefer one set of controls for lighting, temperature, music, video, etc.? Lots of decisions to be made. However, these decisions are typically not high on the priority list of a new home owner during the early stages of building a home. Thinking about the modern conveniences of home electronics is sometimes put off until it is too late or at the very least much more costly. If you examine a few of your preferences before the drywall goes up, your electronic “afterlife” can be lot more fulfilling. Most builders are not electronic specialists. They certainly know more about home construction than about home systems. That is why you will need to be persistent in most cases to get what you want. Many builders focus only on TV and telephone outlets and their placement. You may need to make sure you are getting all that you need and want. TV and telephone outlets should be a home run to a central location (that is, each wire should terminate at a common central point). This facilitates easier changes in the future and provides the purest signal quality. For telephone, ask for data grade, category five wiring. This will serve your internet requirements better. For TV, the RG-6 cabling is superior and carries a higher bandwidth rating as well. Some people often ask about fiber optics. This cable is more expensive, and competing standards do not Necessarily make it a wise choice. With the high number of coax and telephone wired homes, the best bet is CAT5 and RG-6. 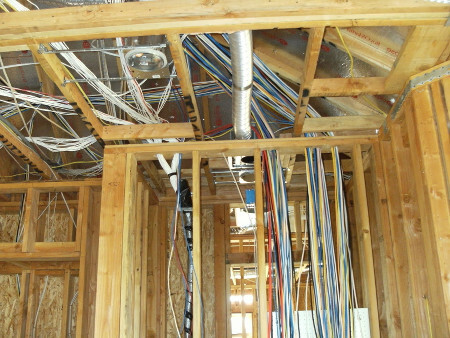 Wiring for a new home is simple and straightforward. Commonly available wiring is used. All wires should be run to a central location (such as a utility closet, entertainment center or similar place). Telephone and TV wiring can be separated from the audio wiring, but many homes choose one central location. Run CAT 5 or better wire for telephones and data lines. This will provide for four lines to each location. Run RG-6 coax to all TV and touch panel locations. Dual runs of these wires make future expansion a possibility. When running audio wires run four conductors (16/4 or better) Through all keypad, volume control and touch- panel locations. This provides the best flexibility in the future. Then run 16/2 to each speaker location. Run CAT 5 for control wires to each keypad, volume control And touch panel location. This will allow IR and network control of these devices. Incoming service lead wires will need to be run for telephone, cable, satellite, door speakers and any cameras. If a computer network such as LAN is planned, run separate CAT 5 wire for this purpose. If lighting control is the desired upgrade, most manufacturers have control wires that need to go to the control lo- cations of your choice. Control wiring for security and HVAC systems, you should consider interface wiring for house-wide control systems.